Seven hundred and fifty Jewish refugees fled Nazi Germany and founded the agricultural settlement of Sosúa in the Dominican Republic, then ruled by one of Latin America’s most repressive dictators, General Rafael Trujillo. 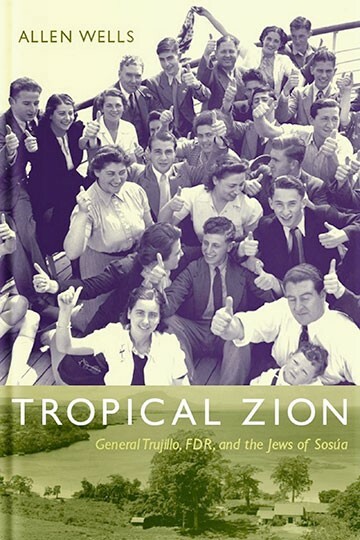 In Tropical Zion, Allen Wells, a distinguished historian and the son of a Sosúa settler, tells the compelling story of General Trujillo, Franklin Delano Roosevelt, and those fortunate pioneers who founded a successful employee-owned dairy cooperative on the north shore of the island. Why did a dictator admit these desperate refugees when so few nations would accept those fleeing fascism? Eager to mollify international critics after his army had massacred 15,000 unarmed Haitians, Trujillo sent representatives to Évian, France, in July, 1938 for a conference on refugees from Nazism. Proposed by FDR to deflect criticism from his administration’s restrictive immigration policies, the Évian Conference proved an abject failure. The Dominican Republic was the only nation that agreed to open its doors. Obsessed with stemming the tide of Haitian migration across his nation’s border, the opportunistic Trujillo sought to “whiten” the Dominican populace, welcoming Jewish refugees who were themselves subject to racist scorn in Europe. The Roosevelt administration sanctioned the Sosúa colony. Since the United States did not accept Jewish refugees in significant numbers, it encouraged Latin America to do so. That prodding, paired with FDR’s overriding preoccupation with fighting fascism, strengthened U.S. relations with Latin American dictatorships for decades to come. Meanwhile, as Jewish organizations worked to get Jews out of Europe, discussions about the fate of worldwide Jewry exposed fault lines between Zionists and Non-Zionists. Throughout his discussion of these broad dynamics, Wells weaves vivid narratives about the founding of Sosúa, the original settlers and their families, and the life of the unconventional beach-front colony.